TrustPilot Review - ​I have had my heaters for almost a year now and they are just fantastic. Being from the north, you can image how cold it gets up here (and if you can’t imagine then let me tell you it’s winter all year round up here haha). Its never cold in the house anymore that’s for sure. And you can have the heating in different rooms set to different temperatures... so if you’re doing a roast you can turn the kitchen right down so you don’t cook too. My husband also likes to keep the bedroom cooler - it helps him sleep, so it’s god send really because you can do what you like with the temp in any room. It’s really easy to use and they show you how to do it all. They give you a number you can call anytime in case you have any questions or problems. I haven’t had any. We also had the hot water system put in about six months ago and that’s great too. It’s tiny but you never run out of hot water. So no more big boiler or having to wait for the water to heat up. So we’ve saved some space and time as well as money! My daughter is having hers fitted in January, she can’t wait. First home visit (Mark) - Mark explained the product very clearly and gave lots of information via booklets etc. We even distributed leaflets to other residents here and I am sure once people see the huge difference in product standards, there will be many enquiries. I didn't feel pressurised nor did I feel that Mark just was going through a sales pitch. Options for purchasing in full or via monthly instalments ​were clearly explained as well. Very impressed. Internal support (Chelsey) - Chelsey has been invaluable during the whole process and always responds to queries quickly. Chelsey was instrumental in helping me "persuade" the Management Company here to supply access to the SSE cupboard and emails were sent quickly to progress on to installation. With access to Chelsey's mobile number I was able to keep her updated even over the weekends. A credit to the company! Installation (installation team) - Having had to deal with very unprofessional and disrespectful builders here during the recent new development, it was refreshing to deal with your installation team who at all times gave me the utmost respect and also who kept me informed at all stages of the installation process. I was also confident to be able to leave them in my property when I had to go to a meeting. The explanation of the control panel was very clearly given and at all times the team cleaned up afterwards. Product review (so far) - The new heaters give a modern appearance without the worry of any leaking (which had happened twice with the previous heaters!) The control panel gives me precise control of the system as well. I also have a new system which is fit for purpose. My old boiler and tank had numerous leaks and had been an issue since I first moved to my flat 2 years ago! I am looking forward to a more economical system without an unsightly bulky system. I have a cupboard back!" "After the difficult winter we just experience (2017 - 2018) I found it necessary to investigate updating my heating due to the lack of effectiveness of my current storage heaters and the excessive costs. One of the companies who provided me with a free home survey was ‘Logicor’. Once an appointment was made I received video links and information which provided clear details about this system and then a phone call from the Stefan to introduce himself as the person who was coming to provide the heating survey. One the morning of the home consultation Stefan rang again to let me know exactly when to expect him and he arrived at that time. His was professional providing all the technician information in an understandable way, which was greatly appreciated. He demonstrated and explained the ‘clear-heater system and the hot water boiler’ and took the time to include me in all aspects of the survey. I was given time to make a decision and did not feel pressured in any way. I was able to contact him with any other questions or queries and he or Chelsey provided the reassurance I needed. Additional information and support has been provided by Chelsey who has been a tremendous support for me. She is always at the end of the phone and provides information and explanations as and when needed, she has also organised and explained the next steps in the process and everything has gone precisely to plan. An engineer (Steve) then came to plan and discuss with me exactly what would be required to provide me with a cost effective total heating system. Once again I felt totally included in the process. He explained the data collected and explained the detailed plans made. He made his professional judgments and listed to my suggestions and the final plan was produced. The day arrived for the installation; a team of four experienced professional yet friendly technicians arrived and explained the plan for the day. The day ran like clockwork I was amazed at home effectively and efficiently they worked in a small ground floor flat removing one system and installing another. At the end of the first day as they left not one piece of rubbish or any equipment was left, all rooms were left in a brilliant state - all cleaned and tidy. During the testing of each of the panels clear information was given and any and all questions were answered I felt totally reassured. Day two and again as described the work was carried out in a friendly manner. Today Scott again took the time to explain and demonstrate the control panel. I am really enjoying the ability to have immediate hot water rather than having to wait for an immersion heater to heat a large tank! Using the control panel I know exactly how much I spend each day so reassuring. The heating panels look great and to date there has been no opportunity to see them. After installation support has continued as described during the initial information given. My experience to date has been perfect; I have no hesitation in recommending this product and company. " “Another happy customer set up with our infrared heaters & control panel in his office”. 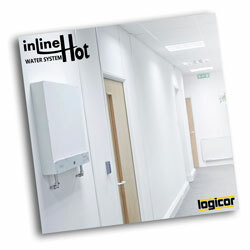 "I have bought a Logicor heating system for my small Home Office in the garden. My problem was in winter, as each morning my office was cold, and it took 20 minutes with me shivering to heat the air in the office using a conventional 400 -1200w electric heater. Now, after a month of use with an "always on" Infra red heating system, the fabric of my office is warm, and using the integrated Control Panel I can easily monitor & maintain the temperature between 16 -19 deg, which works for me. I can see the associated daily costs in both monetary and kWh usage via the integrated Control Panel, and these seem reasonable. I am learning about the health benefits of Infra red heating system, and I would like to install a system in my house, removing my oil fired Central Heating system. You have designed a modern heating system, which has other benefits, and will work well with a Solar PV system I would also like to install. I am a convert." “It was such a pleasure to have tradesmen, who, from the time they entered the house, were very polite and extremely helpful in explaining what they were doing in language we could understand. If we asked any questions they didn’t hesitate in answering. They offered to come back the following morning to check if everything was working properly, which they did. We are very satisfied”. “Your CS Engineer Dale who I bonded with a week ago online with some Clear CH queries, was able to improve my working knowledge of the CH system and enable me to obtain more from my ‘Logicor ipad’”. “The heaters are just fine coming on and off as requested”. “The trials we had so far (which was only on three properties) did lead to successful results and our residents did see a significant decrease in their bills”. “Compared to the cost of the old heating system here (Electric Block Heating) the savings with this new system are astronomical! “Up until now I have had really bad problems with damp and mould and have required extra help with this (even the insides of my wardrobes were constantly covered in mould requiring a lot more laundry tasks than normal). This new system eliminates these problems, as I am sure the Area Manager of my housing association took into consideration when choosing the excellent system”. 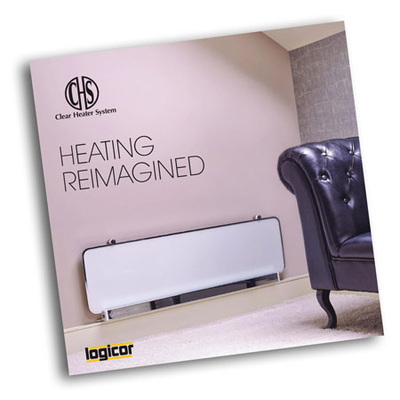 The Logicor Clear Heating System installed in a pilot bungalow of amenity housing has radically improved thermal comfort for our tenants and provided significant savings on their electricity bill”. “In 2016 we shifted house, and moved to our current ‘1950’s / 1970’s wooden tent’. We had a fire as our main heating source. Our water was no longer on a separate meter (shame). We installed the Logicor unit in November 2016. Up till the installation of the Logicor unit, our energy use was running at 9% below 2015. For the months of November and December, with the Logicor unit in, our energy use ran 38% below 2015. We ended the year at 7300 units. Using theoretical modelling, we believe the unit will provide savings of between 30% - 70% on hot water usage. "Our energy use has decreased by 29% overall. Based on past data, if I assume that our ‘non hot water energy use’ has remained static at around 4500 units, this would mean that our hot water use has fallen from an estimated 3000 units to 600 units, an 80% decrease." “A big thank you to the install team comprising MATT and JASON who on Friday 12-Feb installed my 2nd Logicor appliance, this time the ILHWS”. “We have today visited a friend who has this system installed and we were impressed with it”. “Hi Folks, my Clear Heater System is doing great”. “I have your InLine HWS and your Clear CH systems in my house, both of which are working fine and connected 24/7 and can be powered in part from my PV panels & Samsung ESS, weather dependent of course”. “Just to say thank you for the job that your technicians Dale and Jim did for us on Tuesday. They were very polite and left everything neat and tidy. Once again many thanks”. 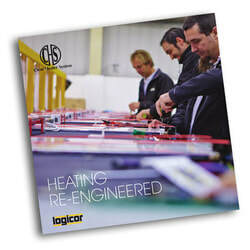 “I would definitely recommend Clear Heater System to anyone who is thinking of having it installed. Not only do you save financially, it does not dry the air as some systems do”. “The system harnesses infrared technology which couples with a dedicated control pad to provide a very controllable system. The heaters are state of the art and we are very pleased with their looks. We were delivered an excellent fitting service and they were very approachable. The works were completed within a day with no mess or clearing up afterwards. 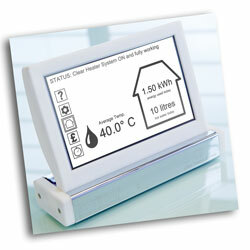 The system shows very low running costs and we look forward to much-reduced electric bills. Sandra and I would highly recommend the Clear Heater System”.